This book was written from the perspective of a grieving and loving mother who watched her little daughter suffer unspeakable pain. It is the narrative of those events and Erin’s and her family’s struggle to keep their faith and to find some kind of meaning and purpose in the challenges that accompanied each day for two years and seven months. Her husband Brandon, daughter Jenna, parents on both sides, siblings, close friends, and hosts of fellow Christians made the journey with Erin as you will discover as you read. Erin and son Elijah (born during the events narrated in the book) came by my office before Christmas, bringing cupcakes and juice. We had an opportunity to talk about her book and the writing of this article. It is with her permission that I make a few observations about her “Letters to Kate,” her fervent prayers, and the application of passages accompanying her narrative. I will begin with a quotation from Erin’s Letter from the Author: “Journaling the ups and downs of our journey was therapeutic. The pain and stress and joys and triumphs poured out of me and collected in a pool of words on the computer screen. But sometimes the story was too hard to tell. The turn of events at the end of Kate’s treatment was such a shock that it was months before I was able to write about it. It was too emotionally raw to dwell upon and put into words. Even after allowing time for the wound to heal, I still wept as I wrote and recounted the end of treatment. The anguish and fear and worry of those weeks was just too deep and perhaps always will be. Two years after beginning, I typed the final words of our story. I felt a sense of closure and peace. That chapter of our lives was over and our new chapter of life after cancer had begun. The blessing of coming home from the hospital seemed a perfect time for applying Job 26:14 – “Indeed these are the mere edges of His ways, and how small a whisper we hear of Him! 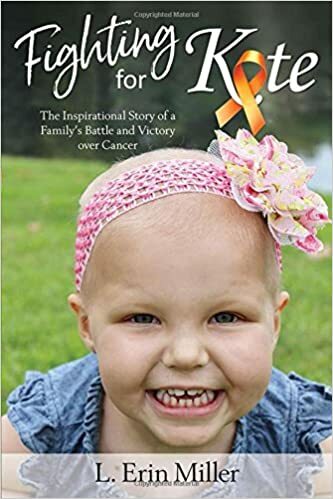 I close this article with the words of my friend Greg Chandler, who wrote in the Foreword to “Fighting for Kate” the following words: “Readers of Fighting for Kate will find a blessing within its pages. Whether a parent facing similar struggles with a child, a Christian in a time of challenge, or simply someone interested in the story, this book provides encouragement and strength. It reminds and equips us with strength to trust in God when the storms of life prevail. It strengthens our faith. Well said, brother. I hope readers of this article will read the book.